Many moons ago, I attended a private elementary school with kids who you'd imagine went on to attend and graduate from Ivy League schools. I can only appreciate my four years there today by knowing what a sacrifice my parents made for me to attend. In those four years, I had one wonderful teacher, who made me feel special. But I have more memories today that leave a bad taste in my mouth, knowing my presence wasn't appreciated by everyone and I was very different. One afternoon, while in after school care, the school secretary sent for me to come to the office. I stood, she sat. She said, "You know you are a very lucky girl to be able to go to this school. Your parents don't pay what the other parents pay." At the time I kinda knew that was inappropriate, but I didn't tell my mom about it until I was long gone from there. The older I got, the more it hurt my feelings. I was an independent student. I had trouble in the first grade with reading and there was a lot of one on one practice with my grandmother that year. But after I learned to read, my homework was my homework, and if it was wrong it was wrong. The year of my first science project, I asked my dad if he could take me to the park so that I could collect some rocks. It was the state park and it was very nice, so I thought there would be plenty of rocks to choose from. What I came home with was different shapes of flint and limestone looking rocks - nothing special. I washed my rocks, decorated a shoe box with tin foil and that was my science project. Fast forward to "Presentation day"
ALL of the projects were elaborate. I wanted to crawl in the hole I dug my rocks out of. The only project I remember was a real life chicken incubator! I don't know the official name for it, I'm not even going to look it up. But it had eggs in it and somehow the timing was right that they were hatching during the science fair. In my memory, my box of rocks was parallel to the incubator. I look left to see the big fat S- scrawled in red ink, and look to right to see the A+ seemingly written in black calligraphy. Each year thereafter, my science project was still my science project and I would just let my parents know what I needed. Nothing ever went as my bright idea hoped. In later years my solar systems didn't make it to school in one piece or the experiment didn't work when I made my presentation. I never got a good grade. Yes I felt sick in the pit of my stomach. There was a date to turn in the topic, a date to turn in the research plan and the final project was due January 6th, the Monday after the Christmas break. There was football season, basketball season, baking, blogging, birthday's, shopping and preparing for travel. There's really a bigger story here to tell you how it felt in all it's aggravation, sweat, tears and pleasure to do this with my son. But I'll conclude the post with this moment. 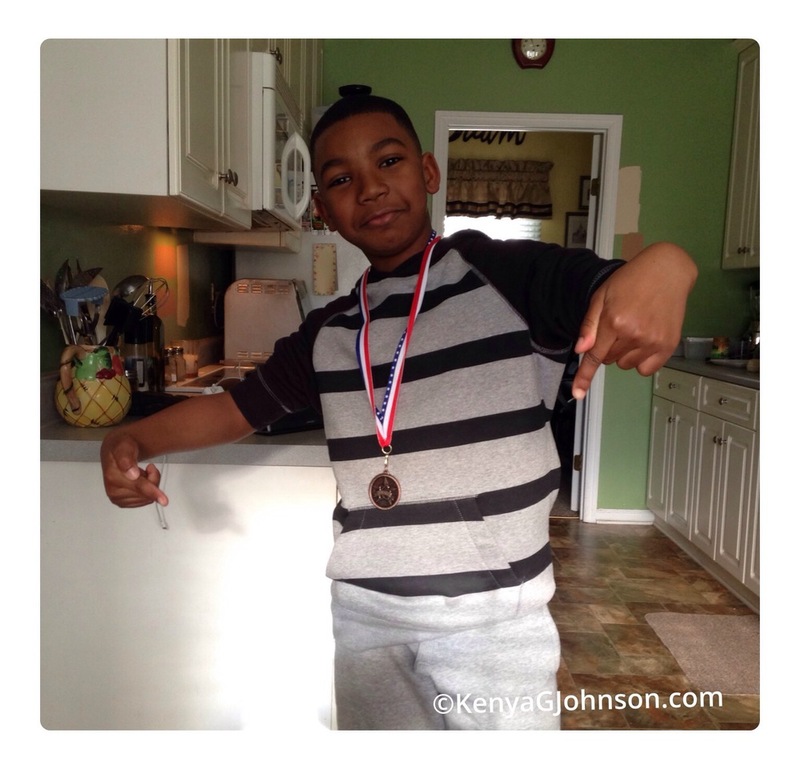 3rd Grade - Christopher won the bronze metal for his science project. We're going to the county baby! This story is "To be continued"